Free Printable Monster Jam Word Search. Free Printable Monster Jam Word Search activity for all the Monster Jam fans. Great if you follow and watch Monster Jam on FS1 or go to the events. You can print and give this activity to your friends, students, parents, neighbors and teachers. Great for a Monster Jam themed birthday party celebration. Search for you favorite Monster Jam trucks like Grave Digger, El Toro Loco, Max-D, Avenger, Zombie, Scooby-doo, FS1 Cleatus, Mohawk Warrior, Madusa, Scarlet Bandit, Bounty Hunter, Metal Mulisha, Hot Wheels Firestorm, Monster Energy and more. This word search includes 24 Monster Jam trucks and the answers on page 2. 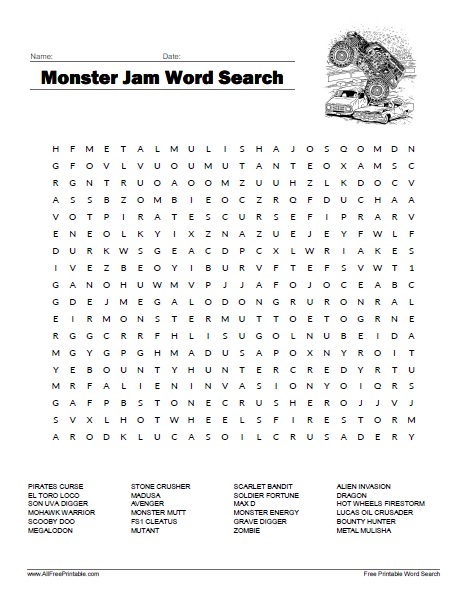 The Monster Jam Word Search Puzzle is ready to print in PDF format.